Rumen-protected methionine (RPM) added to the diet of Holstein cows improves the survival rate of preimplantation embryos. Cows fed methionine have more lipid droplets inside the preimplantation embryo, which could be used as energy by the embryos. 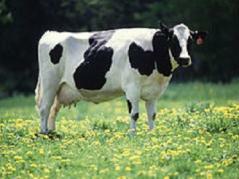 Embryonic death has been shown to drop from 19 percent to 6 percent in cows fed methionine. URBANA, Ill - Research at the University of Illinois has shown that adding methionine to the diets of Holstein cows during the prepartum and postpartum periods may impact the preimplantation embryo in a way that enhances its capacity for survival. This research has been funded in part by Adisseo NACA, in Alpharetta, Georgia, and the USDA National Institute of Food and Agriculture (Washington, DC; W-2112). The study, “Effects of rumen-protected methionine and choline supplementation on the preimplantation embryo in Holstein cows,” has been published in the June issue of Theriogenology and can be found at http://bit.ly/methionine.